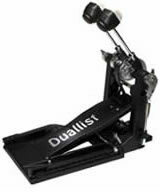 A highly practical single pedal with double-pedal performance, the Duallist frees up the drummer’s other foot for controlled hi-hats or percussion instruments. A fantastic innovative pedal that opens up new creative opportunities. Buy Today and get FREE Gig Grips. The same space age technology which made the Duallist double pedal an award winner is now built into an extra tough, yet lightweight SINGLE pedal. This revolutionary drum pedal is both smooth and responsive giving great speed and feel and an efficient feet-to-beat process. 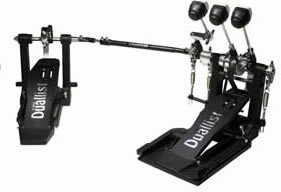 The Duallist D2 double pedal shows how ‘conventional’ double pedals should be made. 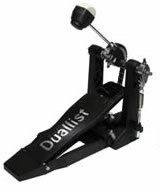 The Duallist D2 pedal uses a double footboard, double beater design as seen on traditional pedals, but uses super tough, lightweight DupontTM Zytel® polymers, and low-noise mechanisms. The most innovative and creative pedal we've ever produced the D3 Triple. As well as providing all of the great performance of a double pedal you get a third beater. 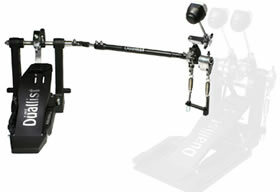 This enables you to play fast bass drum rolls as well as using the left foot to punctuate the right foot rhythm. Also LEFTHAND option with beaters on left pedal. 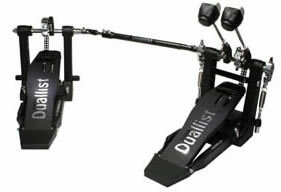 Turn your Duallist Dual into the most versatile pedal ever devised The Duallist Triple, using this easy-connect Triple Upgrade Conversion kit (adds a single pedal to the left foot - as shown). Also available with a single pedal added to the right foot. 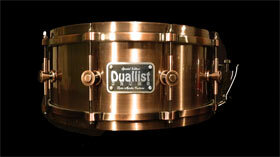 Snare Drum with brushed copper finish. Fantastic sound - fantastic look - fantastic price! Gig Grips Drumstick Grips - Rock Black. Feel your sticks, Feel the beat. Tight on your sticks - Smooth on your hand. No more messy wax, sweaty gloves or tape! As seen on the Grammys and World Tours. Gig Grips Drumstick Grips - Ghost. ACCESSORIES: DUALLIST KEVLAR BELT The tough just got tougher! Kevlar is one of the world's toughest materials, it can protect astronauts, stop bullets and survive the hardest of gigs, time and time again. The Duallist Kevlar belt has been designed to match the unique playing characteristics of the Duallist Double pedal (right belt) with the right mix of power and smoothness. ACCESSORIES: DUALLIST RUBBER BELT Replacement rubber belt for your Duallist pedal, tough and resilient.